Our BTM project management team has conducted a series of interviews with Anesthesiologists who are Going Beyond the Mask - individuals identified by their peers as important leaders in the healthcare system. Interviewees shared their stories and provided insights on a variety of useful topics to help you, our members, become aware of opportunities, tools and support mechanisms. 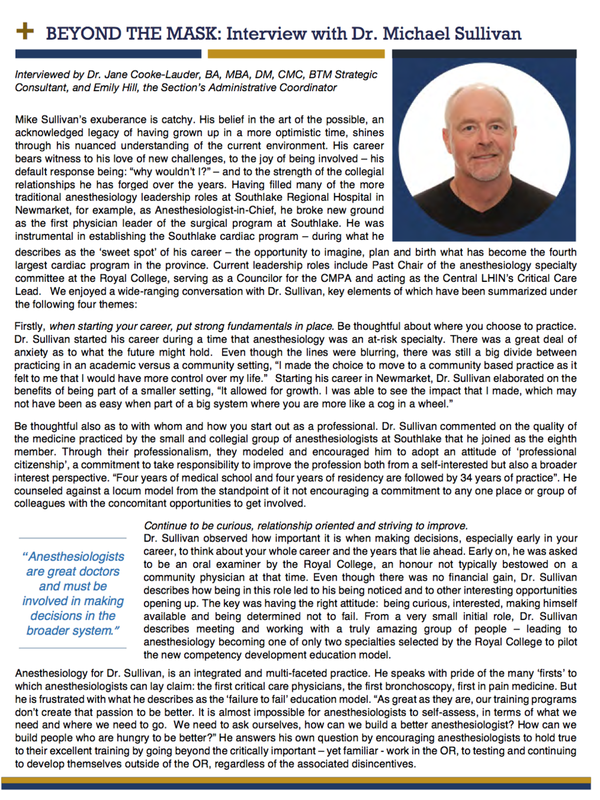 Click here to provide the name/s of other Anesthesiologists who are Going Beyond the Mask. The Section has been exploring a number of strategic issues and concerns on behalf of Anesthesiologists across Ontario and is committed to raising the image and profile of our Specialty. Beyond the Mask, a five-year strategic initiative, was crafted to enable Anesthesiologists to demonstrate innovative and leadership skills and abilities within the perioperative suite and beyond and thus elevate our role and profile in the health care system. If you would like to hear more about our upcoming projects and/or participate in our Working Group, please click here. We were excited to announce the launch of our Choosing Wisely Implementation Guide in June 2017. supporting conversations and actions to reduce unnecessary tests, treatments and procedures. Using a case study approach, this guide includes templates, tools and change management suggestions to enable all hospitals to achieve the benefits of improved patient care. Click here to access the Implementation Guide. Our members are invited to access one of our Resource Centres on PetalMD, including distinct Chief, Family Practice Anesthetist and General Membership groups. 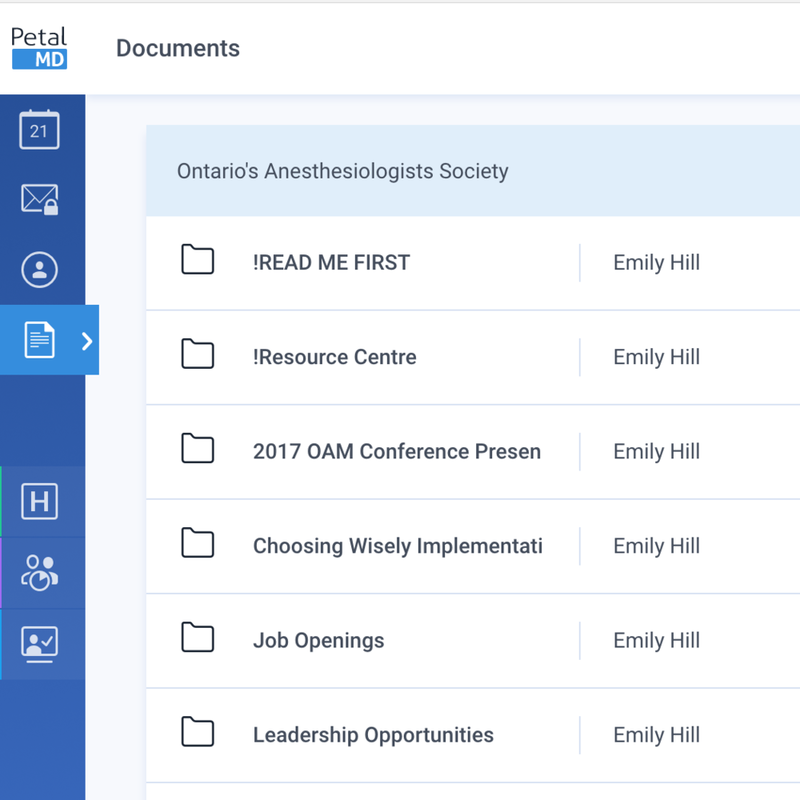 These Resource Centres have dynamic tools for Ontario Anesthesiologists to engage in discussions and share information about a range of peri-operative and leadership activities. They are accessible on your desktop, phone, or tablet. Click here for more details on how to sign-up. In these ever-changing and sometimes volatile times, strong leadership skills are more important than ever. Strengthen your existing skills and build new knowledge and connections by attending one of OA’s Leadership Development Days. Previous days have tackled such topics as strategic leadership in a reform environment and fundamentals of the Ontario health system. For more details on future Leadership Development Days, watch your inbox and the OA’s social media feeds.